In this day and age of wireless controllers for our consoles we all suffer a common problem, recharging them. There are hundreds of controller charging docks on the market in all shapes and sizes so which one do you choose. Well Duracell have come up with a charger that may just be the answer to everyone’s needs. Duracell have a controller charger on the market that is a step above the other chargers on the market. Theirs has a few tricks up its sleeve that makes it stand out amongst the competition. The charger is designed to work with the Playstation 3 slim model although it would work with any Playstation model although it wouldn’t look the way Duracell intended. 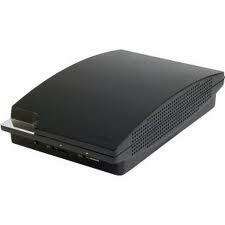 The designers have made it to flow seamlessly with the look of the Playstation so that it looks like one solid unit. Aesthetically this works nicely as it doesn’t look like yet another piece of plastic on your gaming table or stuffed under your TV. The body of the charger holds two controllers one in front of the other under a lid. This is a perfect and simple answer to anyone who has young children or pets that have a fascination with anything not tied down or looks like a new toy. In personal experience I have lost too many controllers to a dog’s curiosity or more importantly its teeth! This charger eliminates that issue as once the lid is closed, any child or pet wouldn’t even know they were there. The other bonus to this is there are no trailing wires apart from the one that connects the dock to the PS3 which are always a bane to anyone who likes a clean gaming set up. Even that wire is long enough to wrap around the back of the whole unit so that it is as invisible as possible. This design is so simple yet perfectly effective I would even come close to calling it genius. The Duracell charger has a few more tricks up its sleeve that really make this charging dock stand out. Firstly it has two simple led’s that let you know when each controller is charged. Red for charging, Green for charged, simple but effective. There is also an option to turn the whole charging unit on and off with a button in case you are worried about overcharging your pads or wasting energy. Yep, ok, these aren’t big highlight features but they are worth noting that Duracell took time to make sure that they got their charging dock working right. Now for the really good additions. 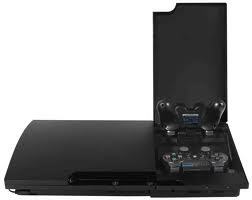 Well for starters they have added the SD and MS card slots that were on the original sized Playstation 3 but were sadly lacking on the slim model. This is a fantastic addition as you now have all the options back for transferring photos from cameras as well as transferring music and game saves between computers and Playstation. If you never owned an original model Playstation 3 then you may not miss this feature but for those of us that did/do then it’s something that was an annoying loss on the slim models. The second great addition is the additional 3 usb ports that they have added to the unit. The best bit about the addition of the 3 usb ports is that they are not placed on the front of the unit like any normal generic addition might do. The Duracell charging dock has them hidden nicely at the back of the unit. So what? Might be thinking but this is great for connecting all your additional gaming attachments to your Playstation without having all those wires strewn across the front of your system and looking unsightly connected to the front. With only 2 usb ports on the Playstation 3 slim model and one of those taken up by the connecting wire that connects the charging dock it’s nice that they have added more on the unit. This is another feature that they seem to have brought back from the original sized Playstation 3. The original had 4 ports and was another complaint that fans had with the slim reducing that amount to 2. It seems that whoever designed this charging dock was not only a Playstation fan but a fan that owned an original system and wanted to bring back as many of the original features as possible. The design has been thought about carefully and this has been created to meet the demands of virtually every gamer’s needs. I am surprised that this comes from a company not usually thought of as a gaming accessory manufacturer but maybe that is what was needed. This outside company took a fresh look at what was needed and made something a bit different from the average run of the mill charger on the market. If you have a Playstation 3 slim model then I would say this addition is about an essential an accessory as you could get. The real icing on the cake is that the original price for this was around £30 but amazon are now selling this at around £9 – £13, in my personal opinion this is an absolute bargin.